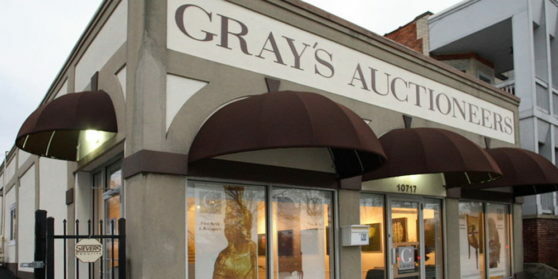 Gray’s is a boutique auction house specializing in fine art & antiques. Founded in 2006 by Deba Gray & Serena Harragin, Gray’s auctions are held live in the auction showrooms and simultaneously online, allowing local, national and international bidders to bid as if they were all together in the auction showroom. Gray’s auctioneers are licensed, bonded and insured giving consignors the confidence to know their items are protected throughout the auction process. With expertise across the spectrum of fine art, antiques & decorations Gray’s continues to expand into new markets, championing modern, post-war and contemporary art and design with record setting results. Gray’s accepts consignments and offer complimentary auction valuations every day. Our appraisers also provide USPAP compliant appraisals for insurance, donation or estate tax purposes. With a reputation for stellar service Gray’s has captured the attention of collectors, both buyers and sellers, from across the world, becoming one of the most well respected auction houses in the region. Gray’s – Local Experts with a Global Reach.